Jangl teamed with Plentyoffish.com to let online daters get to know each other via text messages, phone calls and voicemail without sharing their real numbers. Jangl has also teamed with Facebook, Bebo, Match.com, Friendster, AdultFriendFinder, Tagged and Fubar to market and provision applications enabling text messaging, voice and voicemail for the tens of millions of members of those communities. Through this partnership, Jangl is delivering all three applications text messaging, voice and voicemails to Plentyoffish members. Ranked as the U.S.’ number one dating site by comScore, Plentyoffish generates over 600,000 relationships a year in the United States, Canada, Australia, Ireland and the United Kingdom. The free site receives an average of 1.3 billion page views per month, according to founder and CEO Markus Frind, who still personally runs the website from his apartment. According to InfoCom’s most recent report on VoIP retail consumer offers, the three largest VoIP providers in Western Europe are Orange, Neuf Cegetel and Free. All three are French providers whereby Orange, with its Livebox, is also active in the Netherlands, Spain and the UK in addition to France. All in all Orange had 3.57 million VoIP customers in these four countries at June- 2007 (it has also 71 000 VoIP subscribers in Poland) and is thus clearly the largest VoIP provider in Western Europe with an estimated 14% market share. Neuf Cegetel and Free (Iliad group) are then clearly the number two and three, followed by BT and United Internet. All main providers are basing their VoIP service mainly on DSL rather than on cable modem. Bandwidth.com improved their online VoIP Test at http://www.bandwidth.com/tools/voipTest. The free test measures critical factors of your Internet connection such as throughput, latency, and SIP port tests to see if your connection can handle VoIP calls. A critical factor in deciding whether your connection can handle VoIP is upload speed. While connections supplied by cable companies and traditional telecom companies have fast download speed, the upload speed is usually much slower, such as 400 Kbps for ADSL and 400-600 Kbps for cable. Using such a connection for both Internet and VoIP applications may result in poor call quality. A T1 connection from Bandwidth.com provides 1.54 Mbps of upload speed. Raketu introduces the Windows Mobile version of the company’s VoIP communications software. Raketu’s Windows Mobile version runs native on Windows Mobile device handsets, enables smart phone users that run the PPC2003, WinMobile5, and WinMobile6 Windows Mobile operating systems to make free and low cost VoIP calls globally. Currently, all pre-paid customers of Raketu’s desktop based "RakOut" computer-to-phone VoIP services enjoy 1200 minutes of free calling each month dialing from their PC to landline and mobile phones in over 42 countries around the world. Starting immediately, users of Raketu’s Windows Mobile application will be able to take advantage of the same free calling promotion. Additionally, Raketu Windows Mobile users will be able to make Raketu phone-to-phone calls, send instant messages, sms-text messages and email. CounterPath has entered into a definitive agreement to acquire FirstHand Technologies. The acquisition will allow CounterPath to combine its suite of softphone and server applications with Fixed Mobile Convergence solutions from FirstHand to deliver an integrated communications experience and empower workforces to go mobile. "Mobile VoIP technologies are in high demand and the market is rapidly moving from trials to deployments," said Greg Pelling, Chief Executive Officer of CounterPath. "The acquisition of FirstHand allows us to extend our carrier and enterprise client value proposition from the personal computer to most major mobile devices. All of our tier one fixed-line carrier customers own, operate or partner with a mobile service provider in one form or another. Our new mobile software products create tremendous opportunities for CounterPath to lever our trusted supplier relationships and add even greater value to our world class customers' VoIP offerings." JAJAH has been selected to join the Microsoft Startup Accelerator Program. Stewarded by the Emerging Business Team at Microsoft the program is designed to connect high-potential startups committed to the Microsoft platform to an extensive support network that provides access to Microsoft people and programs, guidance on future directions, and support to accelerate their success. "Microsoft is a valued partner in helping us deliver scalable managed voice services to millions of consumers, enterprises and carriers in over 122 countries," said Trevor Healy, CEO of JAJAH. "JAJAH provides advanced IP voice services while always partnering with the telecommunications carrier in the local market. These next generation IP services are indispensable to carriers, whether on-the-web, in-the-home or on-the-go on Windows handsets." As VoIP becomes a standard communications system for the global enterprise, industry experts are actually seeing extensive delays around proof-of-concept deployments converting to production. To help determine the causes of this hesitation, NetIQ, an Attachmate business, conducted a survey to measure customers’ adoption of VoIP, attitudes toward initial deployment and sentiments around ongoing management of enterprise VoIP implementations. Comprising feedback from over 240 VoIP practitioners predominantly located in North America, the representative sample demonstrates a strong focus on the value of assessment and planning prior to deployment. The results, however, indicate that a high number of VoIP implementations exclude monitoring and management tools designed to monitor Quality of Service – the very tools required to meet the sample’s desired system performance objectives. Ipswitch announces the results of its ninth Spamometer survey, revealing that 96.4% of all email received is spam, the highest rate since recording began. This compares with 95% the previous quarter and only 84% over the same period last year. The biggest category of spam, finance, accounts for 41% of all messages received in an email inbox; a quarter of spam emails were categorized as medication; with pornographic emails accounting for 21%. The rise in financial spam mirrors the current trend for emails requesting recipients to call illegitimate call centers and pass over personal financial information known as 'Vishing.' 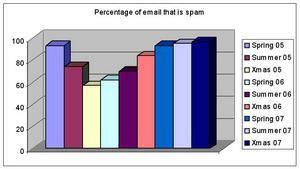 Ipswitch's research also found that spam from botnets accounted for 72% of all spam generated. Medication spam has been knocked off the top spot for the first time in three quarters. Finance spam emails have risen from only 12% the previous quarter to 41% over the holidays. Pornographic emails descended to third position this quarter, down from 21% to 16%. eMotive Communications launches RingJam 2.0 for Skype Extras. The company also partnered with Universal Music Group to give RingJam 2.0 users access to UMG's market-leading digital music catalog. This features chart-topping artists including Kanye West, Amy Winehouse, U2, Fergie, Abba and Ella Fitzgerald, among thousands of others. Also as part of the RingJam 2.0 launch, Skype Extra users will now be able to call friends and announce themselves using video clips provided by Guinness World Records, Fun Little Movies and StupidVideos.com. Ribbit is ready to unveil its first consumer service code-named "Amphibian," the service transforms any physical phone into a physical/virtual "dual world" phone, enabling consumers to use their current phone plans in any number of new and evolving Web environments. Amphibian which will be available in the second quarter of 2008 is the first of many applications in a new technology category dubbed "voiceware." Ribbit also announced the opening of a new online marketplace for voiceware applications being developed in partnership with its 2,500-plus developer community. Ribbit unveiled all three - the new category, product, and marketplace at the DEMO 08 Conference, a premier launch venue for emerging technologies. Vonage has asked a federal court to prevent the state from forcing it and its customers to pay a state telephone fee. In a lawsuit recently filed in U.S. District Court, Vonage says the Nebraska Public Service Commission and its officials should not force it to pay into the state's Universal Service Fund. "These defendants know that Vonage's service is subject to exclusive federal regulatory jurisdiction, yet they are attempting to compel Vonage to pay a state-law surcharge for the Nebraska Service Fund in violation of the United States Constitution, the Communications Act of 1934 and the Telecommunications Act of 1996," the complaint reads. Traditional phone companies pay into a Universal Service Fund. But VoIP providers say they provide an information service rather than a telecommunications service. So what's your take--should Vonage have to pay into the Universal Service Fund just as traditional telephone companies do? And even more to the root of the issue, is Vonage an information service or telecommunications service? Pulvermedia announces the twelfth annual Spring VON.x Conference & Expo will take place March 17-20, at the McEnery Convention Center in San Jose. The Industry's largest, longest-running, and most respected Internet communications event now adopts the VON.x brand, which signifies the inclusion of technologies such as IP-voice, IP-video, wireless, presence, instant messaging, social media, and many others that have enhanced and evolved the Internet communications industry. From a content perspective, VON.x continues to address the leading issues and trends in the industry. The upcoming San Jose event features full tracks dedicated to Wireless; Unified Communications; the Innovator's Forum, including the "Unconference"; Video on the Net; and Open Source Telephony, as part of Digium Asterisk World. Hundreds of sessions featured within these tracks reflect the contributions of the newly established VON Advisory Board, who have helped to bring a fresh and comprehensive perspective to the program. Details on the complete conference program are available at: http://www.springvonx.com/agenda. Vyke announces its acquisition of Callserve Communications, a UK-based telecommunications service provider. The deal is expected to be sealed by the 30th January 2008, for a maximum consideration of £2.9 million. The acquisition of Callserve compliments and expands on Vyke's existing operational base in the UK and will enable greater penetration into the UK market. Callserve also has existing African and Middle Eastern distribution networks, where customers will benefit from conversion to the Vyke product suite. TalkSwitch is proud to announce that it has been chosen the best VoIP system for small business by the readers of Small Business Computing Magazine, and has been awarded the magazine's 2008 Excellence in Technology Award in the VoIP category. Unlike most other industry awards, the results of the 2008 Excellence in Technology Awards are based on nominations and votes from the readers. The awards were handed out in 26 different categories. TalkSwitch emerged victorious in the VoIP category over several companies, including Fonality. A complete list of winners from all categories is now available.